A Sri Lankan government statement that it is not responsible for the safety of civilians who remain in areas controlled by the separatist Liberation Tigers of Tamil Eelam (LTTE) indicates an appalling disregard for the well-being of the civilian population and is contrary to international law, Human Rights Watch said in a statement issued earlier this week. There are continuing reports of high civilian casualties in the fighting between government forces and the LTTE in the Mullaittivu district in northern Sri Lanka. A Ministry of Defense statement issued on February 2, 2009, states: “While the Security Forces accept all responsibility to ensure the safety and protection of civilians in the Safety Zones, they are unable to give such an assurance to those who remain outside these zones. 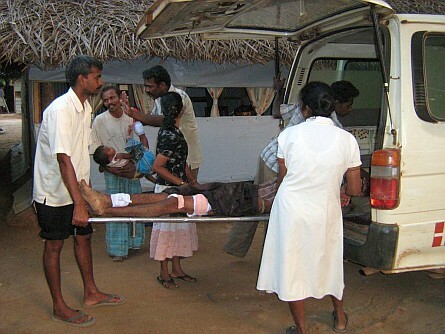 Therefore, the government, with full responsibility, urges all civilians to come to the Safety Zones; and also states that as civilians who do not heed this call will be among LTTE cadres, the Security Forces will not be able to accept responsibility for their safety.” Combatants who order or conduct deliberate or indiscriminate attacks against civilians are responsible for war crimes. In an interview with the media, Sri Lanka’s Defense Secretary, Gotabaya Rajapakse declared the Puthukudiyiruppu hospital a legitimate military target. “No hospital should operate outside the Safety Zone…everything beyond the safety is a legitimate target,” according to Gotabaya Rajapakse. The Defense Secretary admitted to the responsibility of the Sri Lanka Army (SLA) for the shelling of Puthukkudiyiruppu hospital. The targeting of hospitals is a clear violation of international rules of war.